Scene of the Crime Operatives examine the crime scene and the slain suspect’s body following the alleged shootout. 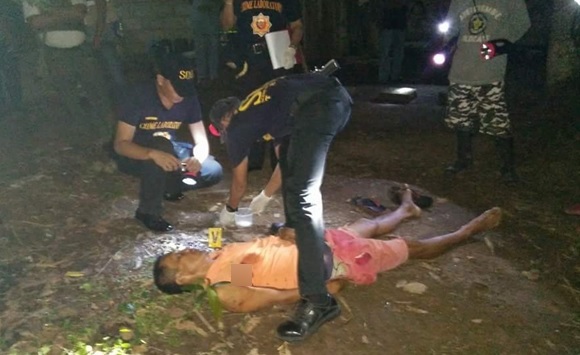 A suspected drug pusher was shot dead after he allegedly engaged police officers in a shootout during a buy-bust operation in Carmen. Police identified the fatality as Vicente Sumampong, 54, a resident of Barangay Bicao, Carmen. Sumampong was allegedly caught red-handed selling shabu to a police poseur-buyer at his home. Police said that that as the transaction was made, the suspect suddenly became suspicious, and pulled out his .38 caliber revolver. He allegedly shot at police twice but missed. Police officers on standby around the buy-bust area then returned fire, killing Sumampong on the spot. After the shootout, crime scene investigators recovered one pack and three sachets of suspected shabu, a cellphone and the .38 caliber revolver from the suspectâ€™s possession. Meanwhile, the suspectâ€™s kin and others close to him asked for justice as they claimed that the death of Sumampong was a case of extrajudicial killing. Some of those who knew Sumampong said that the suspect had ended his involvement in illegal drug activities long before the said anti-drug operation. Other residents in the area said that Sumampong was just picking up tangkong or Chinese watercressÂ butÂ was intercepted by the police on his way home.